When Frederick Allen was in Paris in 1914, he studied with Paul Wayland Bartlett at the Académie Colarossi. Bartlett was well known for his realistic Beaux Arts style animal sculptures, which he cast himself in bronze using the lost-wax process and colored with experimental patinas of his own creation. He had learned to draw and sculpt animals at the École des Beaux-Arts under the tutelage of Emmanuel Frémiet at the Jardin des Plantes and modeled animals for use in sculptures all over Paris. Bartlett was clearly influenced by the popular ceramics of Bernard Palissy from the 1500s, who crafted platters and bowls covered with realistic creatures cast from life and glazed in bright colors that imitated nature. Those creatures included frogs. His collection of small decorative bronzes were popular and praised at the Salon of 1895. The Boston School Artists were all trained in the academic traditions of the Paris schools. When the war started in 1914, Europe changed. The event also changed the attitude that to study in Paris was a “necessity” for an artist’s reputation. Consequently, American artists came into their own. Allen studied first at the Académie Julian under Paul Landowski. When Julian closed, Allen entered the Académie Colarossi and learned from Bartlett. He spent his time sketching in the museums and galleries, taking in the rich Beaux-Arts culture of Paris. What he learned inspired him. He returned to Boston in 1914, began his career teaching with other Boston School artists at the School of the Museum of Fine Arts and, as a founding member of the Guild of Boston Artists, started to exhibit his work. 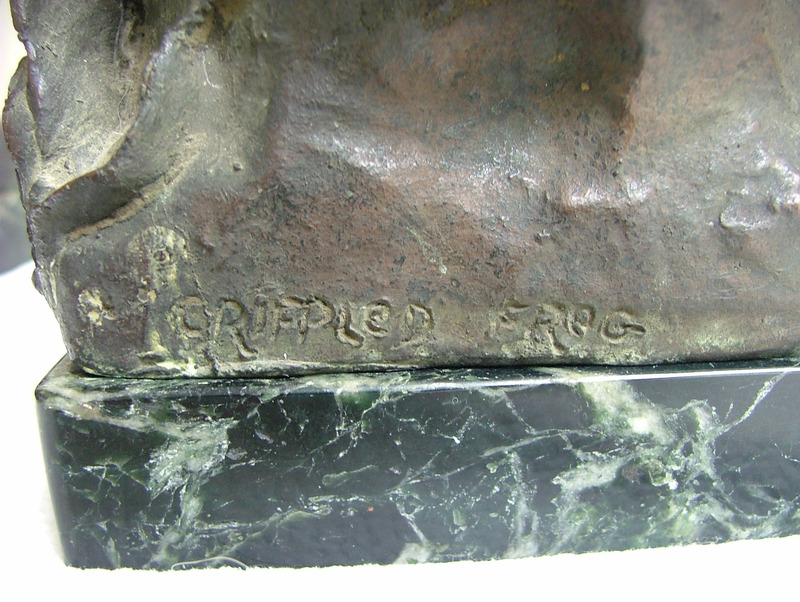 These frog characters in the Paris Beaux-Arts style were exhibited at the Guild of Boston Artists, at Doll and Richards Gallery, at the St. Botolph Club and at the Minneapolis Museum of Art. With all that Allen gained in studying the Paris sculptors, he must have been especially influenced by his own teachers there. 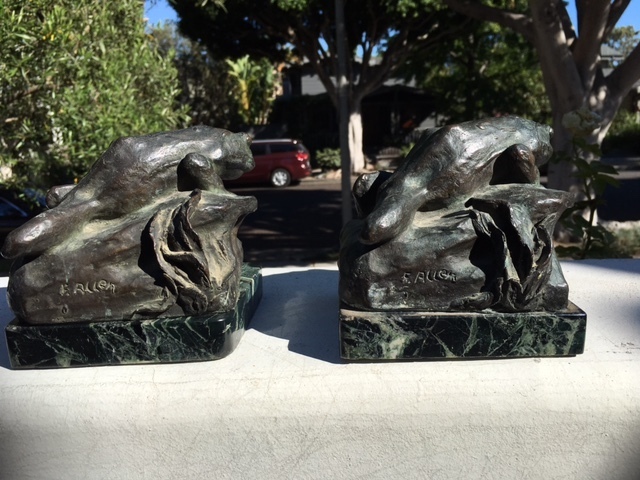 He mastered the lost wax process of casting and chose interesting patinas to color his bronzes, techniques for which Bartlett was well known. Notice on the frogs pictured here, the variation in color and texture from the shine and transparency of the golden eyes to the antique matte yellowed appearance of the metal around the amphibian’s legs, belly and feet, almost like dried mud in which you might have found him. 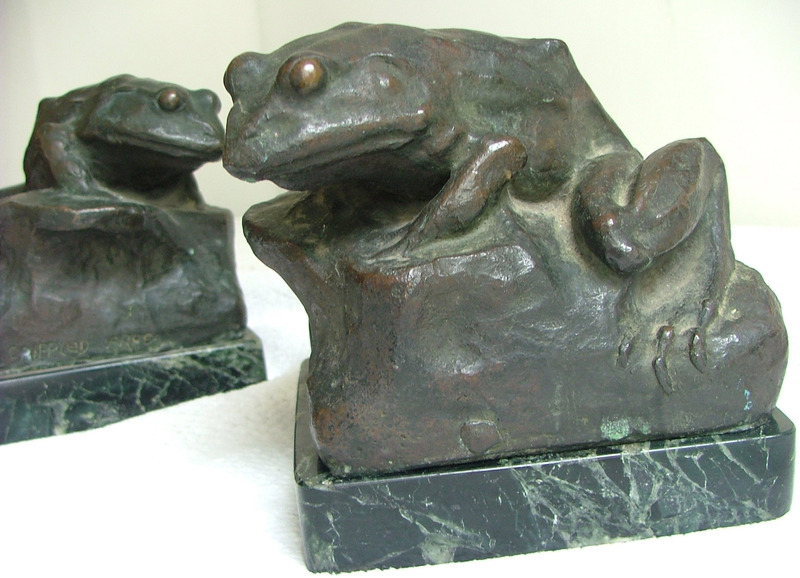 The green, reddish brown and black mottled colors have depth like a good ceramic glaze and are realistically frog-like. Rather than being strictly natural like a life cast, Allen took artistic license and played with the light in an impressionistic way, modeling the animal with a textured surface, showing the clay and leaving some details to the imagination. Allen had learned animal sculpture not only from his keen observations in nature, but also from Pratt who, like Bartlett, had studied in Paris with Frémiet, the second finest and best known of the Animalier sculptors. As a studio assistant to Pratt, he sculpted an eagle, a seagull and a squirrel. (“Mr. Pratt gave me a seagull and a squirrel to model for a fountain he was to make.”) In the winter of 1913 he had been given the project of sculpting the horses for the Lord Jeffery Amherst and the Polo Player. In Allen’s classes at the School of the Museum of Fine Arts, he taught animal sculpture, leading some of his students to play with that subject matter extensively. In his own work as well, he chose animals as subjects. Find among his pieces two elephants, two flying horses, two eagles, three frogs, small birds, a wolf, a pony head, a turtle, a fish, a duck and a dolphin. In his personal life, he enjoyed nature, spending time with his children showing them creatures in his hands, in the woods and in the sea. He kept a pet baby porcupine for a while who did a little ritual dance they would marvel at every morning and made a cage and exercise wheel for some field mice, demonstrated the strength of a snapping turtle’s jaws with a stick as bait and showed them the turtle’s little ping-pong ball shaped eggs, taught them how to care for and feed a baby bird, had them touch a smooth green grass snake and let it slide through their hands. And of course there were house pets, three cats a dog and a parrot. He loved being in nature, appreciated it, and showed that appreciation in his sculpture. 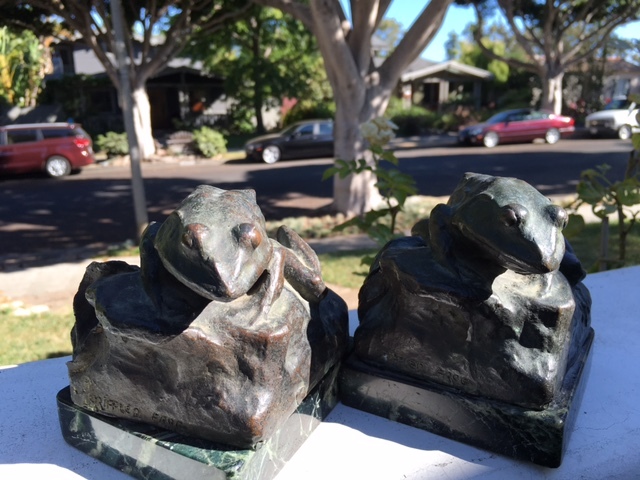 Charming and sad, these two frogs were modeled in clay, cast in bronze with a dark greenish brown patina, and mounted on flat platforms of dark green Verdigris Vermont marble. 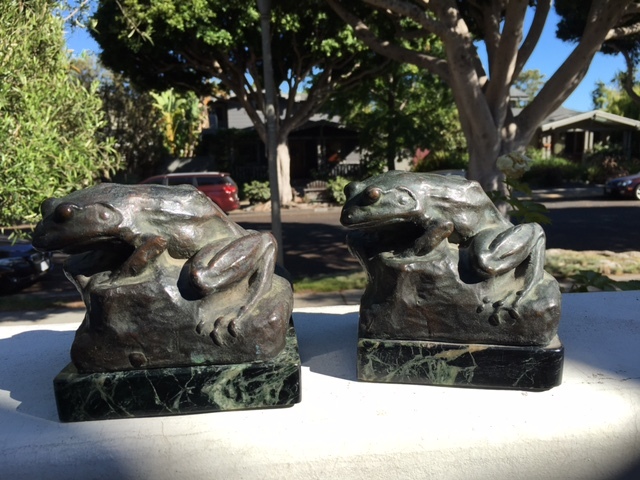 There are slight differences in the two frogs indicating that they were two separate sculptures. The most noticeable difference is the leaf hanging from the rock at the back with slight differences in the details of the rock itself. The right rear leg of one also appears slightly different as does the angle of the heads. Exhibited at The St. Botolph Club, April 10-21, 1916.